10Mb, 20Mb, 100Mb and Gigabit Fiber Internet via Metro-E, leased fiber, and SONET, the ultimate ethernet based Internet for Atlanta, Georgia business. Need more Speed? The ultimate Internet bandwidth is Fast Fiber Internet from Net2Atlanta. Fast Fiber Internet is available in the Metro-Atlanta and North Georgia Areas. Via Metro-E and dark fiber, we provide high speed Internet to the 404, 678, 770 and select 478 and 706 area codes. We serve Georgia as far south as Macon, all of Atlanta and surrounding communities, and as far north as Gainesville. Fast Fiber Internet is delivered to your business via fiber optic cable to an ethernet port at speeds of 10Mb, 100Mb, and Gigabit speeds. Depending on the location of your business, we may use either Metro-E, leased fiber, or our SONET ring to deliver the ultimate in business Internet. The bandwidth is symmetrical, like T1, only way faster! Fast Fiber Internet is more cost effective than DS3 (T3). The ethernet loop is less expensive, as is the interface equipment. DS3 requires a special interface on a capable router. 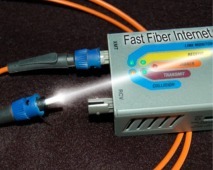 10Mb to 1Gb Fast Fiber requires only a 100Mb or Gigabit ethernet interface, which almost every router has. Many offices use our service to deliver Internet over fiber, but our Fast Fiber service can also be used to connect your offices together via high speed ethernet at 4Mbps, 10Mbps, 20Mbps, 50Mbps, 100Mbps, or 1Gbps. This metropolitan area network is an extension of your office network making it easy to move files, backup systems, and print to different offices across town. VLANs can be extended across town or even across the state. Our service is really an ip transport service and/or layer 2 ethernet transport service. This service is perfect for a disaster recovery program. The high speeds allow real time backup to ensure the DR site has up to date data. And, if needed, we can co-locate your equipment at our Marietta Data Center. Or for maximum Internet connectivity, we offer Atlanta colocation at 56 Marietta St, where you'll have access to many fiber optic Internet connections. Fast Fiber Internet is very affordable for businesses that really need the speed. Pricing varies according to speed, term & location, but generally costs between $800 and $1800 per month. Compare that to T1 pricing, typically around $400/mo for only 1.5Mbps! Cost per Mbps can be as low as $50 with Fast Fiber, compared to $300 or more per Mbps for T1. And it is more reliable than cable. The drawback? Installation varies widely. Some sites require preparation such as conduit to the street or significant extensions to the fiber network. Please contact us for more specific information about your site. If your office is in one of our lit buildings, our service can be much more affordable. We can help you find dark fiber in Atlanta also! Looking for Atlanta DSL Internet?